June 22nd – I’ve changed the picture for this post from a generic Garrison picture to the label for the new brew. Editor’s Note: Here’s a press release I received from Garrison Brewing advising of the first of two new special 15th Anniversary beers they will be releasing. 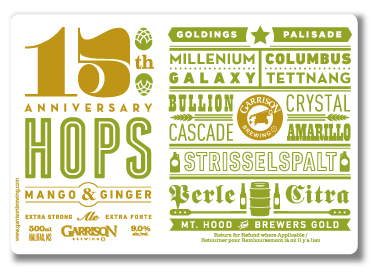 HALIFAX, NS – June 21, 2012 – One of Halifax’s original microbreweries, Garrison Brewing Co. is celebrating 15 years of independently crafting award-winning, all-natural beer. To commemorate this milestone, Garrison will release the first of two unique, specialty brews this Saturday. The theme for this first release is a celebration of a key brewing ingredient – hops! A whopping 15 distinct hop varieties have been added to the boil along with loads of real mango’s and fresh, shaved ginger. “This hazy, unfiltered brew has a dizzying blend of aromas and flavours such as pine, sweet tropical fruit and citrus. It really covers the full spectrum of what hops can deliver,” says Garrison Brewmaster, Daniel Girard. “15th Anniversary Hops, Mango & Ginger” is sold in 500ml single-serve bottles and will officially go on sale Saturday, June 23rd, at the brewery store and all four private stores (while supplies last). Garrison Brewing Company is an award-winning independent microbrewery located in the Halifax Seaport. They produce distinctive, unpasteurized, all-natural ales in small batches. Now in its 15th year, Garrison distributes craft beer throughout the Maritimes and beyond in bottled and draught format. Sounds like music to my belly!!! Girard is without a doubt the most talented brewmaster Nova Scotia has ever seen. Keep it up Daniel.